The Ghica family (Romanian: Ghica, Greek: Gikas, Γκίκαs) were a Romanian noble family active in Wallachia, Moldavia and in the Kingdom of Romania. In the 18th century, several branches of the family went through a process of Hellenization (into the Phanariote social network). 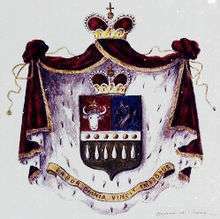 The Ghicas also held the (agnatic) rank of Princes of the Holy Roman Empire (Fürst), a title first bestowed upon Grigore II Ghica in 1673 by Leopold I.
Grigore Ghica, the first Prince of Wallachia (1659-1660 and 1673-1678) from the Ghica family. The Ghica Palace in Colentina, Bucharest, 1859. The family's origins are not clear and there isn't yet a consensus among scholars. Ghica family's origin is from Labovë e Madhe and a branch of the family still live there. An Albanian origin has long been suggested, also by the website of the family, while others argue for an Aromanian origin. Thus, on the one hand, a legend — – full of Oriental charm, historical inaccuracies and anachronisms — transmitted by the Moldavian chronicler Ion Neculce speaks about two poor boys destined to greatness, meeting on the road to Constantinople, and who promise mutual support in the future to come: one is an "Arbëreshë" ("an Albanian" or "a speaker of Albanian", merchant multilingualism notwithstanding) standing in for Gheorghe Ghica, the founder of the Ghica family, while on the other is a "Turk from Cyprus" — the founder of the Köprülü family. On the other hand, later members of the Ghica family displayed an Aromanian national consciousness (the Austrian branches being heteroidentified as of Aromanian origin) or promoted Aromanian culture — e.g., Grigore III Ghica's plans for an Aromanian school network in the Ottoman ruled areas of the Balkans. Each of the two theories strongly influenced the Albanian and, respectively, the Aromanian communities in Romania and elsewhere, with each claiming the Ghica's as their own. In any case, until 1777 — the year Grigore III Ghica was assassinated for opposing the annexation of Bukovina by the Habsburgs, the Ghicas' identity oscillated only between a Romanian and a Hellenic (Greek-Phanariote) one; subsequently, a firm Romanian self-identity can be ascribed to the family. The family's history and fame, as well as its putative Albanian origins, are mostly known to the Western readers from Princess Elena Ghica's memories, Gli Albanesi in Rumenia. Storia dei principi Ghika ("The Albanians in Romania. The history of the Ghica Princes"). For Dora d'Istria (Elena Ghica's nom de plume), the crumbly theory of an Albanian origin of the family's founder, resurrected after several centuries of latent existence, proved to be very lucrative: it gave a new sense for her Romantic involvement in the Balkan people's emancipation struggle (having previously adopted — and later abandoned — a Hellenophile attitude, by courtesy of her Greek maternal ancestry and under the influence of her Greek tutor Gregorios Papadopoulos), as well as in her anti-establishment attitude generated by the entrenching of the Hohenzollern in the Romanian Principality to the detriment of her family who had high hopes for a return on the throne. She started learning Albanian history, and eventually became — since 1866 — the main advocate in Western Europe of the Albanian cause, despite the fact that she never knew or learned the Albanian language. Her book, Gli Albanesi in Rumenia. Storia dei principi Ghika, which upon its publication in 1873 in Florence caused the wrath of her family, repudiating her, managed to forever shift the public perception towards the Albanian theory for the origin the family, at the expense of the Aromanian one. The book was preceded by a series of articles on the nationalities from South-Eastern Europe and their struggle for independence. After articles on the Romanian (1859), Greek (1860) and Serbian (1865) ethnic identity, Dora d'Istria published in 1866 the article entitled The Albanian nationality according to folksongs. The study was translated into Albanian in 1867 by the Italo-Albanian patriot Dhimitër Kamarda, and was prefaced by a poem with a revolutionary content, written by an Albanian author and addressed to his countrymen, urging them to rise up against the Ottomans. Henceforth, Dora d'Istria became popular in Albanian nationalists circles, whose members did not hesitate to use her name for gaining support for their cause. 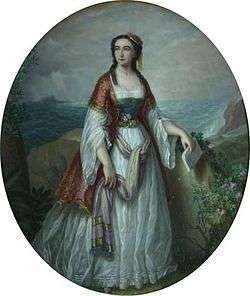 This development was accepted and nurtured by the Romanian author, and she cultivated correspondences with several notable Albanian patriots, including Kamarda and Jeronim de Rada. After the publication of Gli Albanesi in Romania..., the Albanian nationalists in Italy proceeded to declare Elena Ghica as the uncrowned queen of Albania. These speculations were tacitly entertained by Elena Ghica; similarly, other members of the family were drawn into this Albanian nationalistic tradition: at the end of the century, another member of the family, Romanian writer and socialite Albert Ghica would likewise key up vocal demands for the Albanian throne. Modern Romanian historiography has expressed vexation at the appropriation, undertaken by Albanian historiography (and by the unscientific Western scholarly works relying on faulty and superficial theories), of not only the Romanian feminist activist and writer Elena Ghica, but also of the whole Ghica family, at the proliferation of dubious spellings of the family names, false information concerning the birthplaces and other historical facts, and at the family's a posteriori labeling as the "Albanians of Romania". Gheorghe Ghica, the first notable member of the Ghica family, seems to have hailed from Veles, a town in central Macedonia. He was born around 1598 to Matei Ghica (* 1565, Zagori; † 1620, Constantinople), the trunk of the Ghica family. At the beginning of 17th century Gheorghe left his birthplace and moved to Constantinople together with his father who intended to engage in a more lucrative trading in the Ottoman capital. The young Gheorghe, advised by the Moldavian ambassador to the Sublime Porte, moved to Moldavia sometimes before October 1624, where, by means of the wealth his father managed to accumulate, he eventually entered into the ranks of court dignitaries. Following the protection afforded by the Moldavian Prince Vasile Lupu, he climbed up the social ladder, first by becoming ambassador to the Porte, and then by marrying Smaragda (Smada) Lână, daughter of Stamate Lână, the Stolnic (Seneschal) of Broşteni. Following the power vacuum resulting from the failed Transylvanian-Wallachian-Moldavian anti-Ottoman uprising organized by Prince George II Rákóczi, Gheorghe Ghica managed to secure his position as Prince of Moldavia, a position he held between 1658–1659 and 1659-1660. Unable to cope with the financial burdens imposed by the Porte, he was dismissed; nonetheless, following the intervention of Postelnic (Chamberlain) Constantin Cantacuzino, the throne was given to his son Grigore I Ghica. He was Gheorghe Ghica's oldest surviving son, born in Constantinople from a relationship he had with Ecaterina Vlasto, a Catholic from Pera. He had followed his father to Moldavia, where he further raised his family into the ranks of the indigenous Great Boyars, by marrying Maria Sturdza, daughter of Vistiern (Treasurer) Mateiaș Sturdza of the Sturdza family, and niece of the Moldavian Prince Gheorghe Ștefan. Grigore I Ghica's rule was also not free from disturbances due to the conflict with the Sublime Porte and especially because of the disputes between the Boyar parties. Through his political maneuvers and the assassination of his former mentor Constantine Cantacuzino, he instigated the hatred of nobility against him and his entourage. Taking advantage of the defeat of the Ottomans at the Battle of Levice (1664), Grigore fled to Poland and then to Vienna, in search of Habsburg military aid. His hopes having not been materialized, he returned to Constantinople and acquired the Moldavian throne once again in 1672. 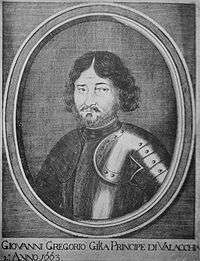 During his short second reign, the animosity of the Cantacuzinos exploded violently, and after the defeat of the Turks at Khotyn in 1673, Grigore was forced to flee to Constantinople; the hostility of his opponents lost his throne and he will die in Constantinople in 1674. Grigore I Ghica's children, most notably Matei (Grigore) Ghica, assured the continuation of the lineage. Matei Ghica lived exclusively in Greek Phanar neighborhood of Constantinople. The marriage with Ruxandra Mavrocordat, daughter of Alexander Mavrocordatos, the Great Dragoman of the Sublime Porte, introduced Matei to the Phanariote nucleus — now the religious, cultural and political hegemons of the Christian Ottoman subjects and vassals — and ensured a path of political ascendancy for his descendants. He became Grand Drogoman of The Fleet, and in 1739 he negotiated an agreement with the Sultan whereby the key position of Grand Drogoman of the Sublime Porte would remain within the fold — i.e. among the descendants of a family pact involving the Ghicas, Mavrocordatos and Racoviţăs. 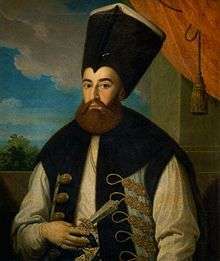 His son Grigore II Ghica, initiated in the intricacies of the Ottoman politics due to his rank as Dragoman, succeeded in acquiring the Moldavian throne on 26 September 1726. During his rule in Moldavia, Grigore II Ghica made proof of great diplomatic skills by leveling an unfortunate conflict with the Crimean Khanate who threatened to ravage the country. In 1733 a swap of thrones took place, with Grigore II going to Wallachia in place of his cousin Constantine Mavrocordatos. Grigore II Ghica's diplomatic skills proved even more remarkable during the Russo-Austrian-Turkish War, when the Prince of Moldavia, at the request of the Porte, acted as the intermediary and mediator between the Ottomans and Russians through correspondence and exchange of envoys with the Russian Field Marshal Burkhard Christoph von Münnich, with John Bell, the secretary of the British embassy in St. Petersburg, with the French ambassador to Constantinople, Louis Sauveur Villeneuve, as well as with the great Ottoman dignitaries. Portrait of Dora d'Istria by Petre Mateescu (1876). ↑ Robert Elsie. A Biographical Dictionary of Albanian History. p. 167. Prince Albert Ghica, also spelled Albert Ghika and in Albanian Albert Gjika, stemmed from the noble Ghica family of Albanian origin. 1 2 3 4 5 6 7 8 9 Paul Cernovodeanu, La Famille Ghika – court historique. Online at Ghika.net. Retrieved on 7 October 2010. 1 2 3 4 5 6 7 8 9 Liviu Bordaș, Dor de Dunăre şi alte nostalgii cosmopolite — Preţul cosmopolitismului, in Observator Cultural, No. 437, August, 2008. ↑ Cf. the article Liviu Bordas, Dor de Dunăre şi alte nostalgii cosmopolite — Preţul cosmopolitismului ("Longing for the Danube and Other Cosmopolitan Nostalgias — The Price of Cosmopolitanism"), in Observator Cultural, No. 437, August, 2008. ↑ Matei Ghika — Fiche individuelle at Ghika.net. Retrieved on 8 October 2010. ↑ Gheorghe Ghika Vodã I — Fiche individuelle at Ghika.net. Retrieved on 8 October 2010. ↑ Christopher Long, Prince Mattheos (Gregorios) Ghika — Family Group Sheet. Online at Mavrogordato / Mavrocordato Family. Retrieved on 7 October 2010.